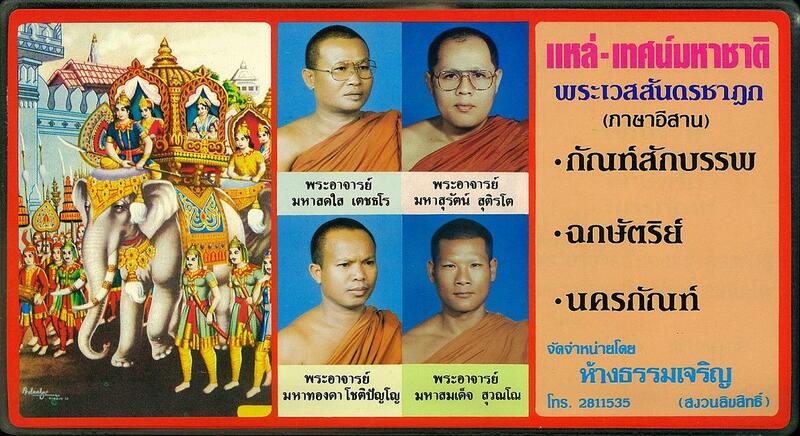 it's thet mahachat season in thailand, and so today i'd like to share this epic boxed-set, featuring a northeastern take on the sermons. thet mahachat (or "the great birth sermon") is the reading of the vessantara jataka (phra wetsandon chadok in thai), the final and most popular of the tales concerning the buddha's past incarnations. celebrated throughout southeast asia, the story features prince vessantara & his journeys, wherein he exemplifies the virtues of charity & selflessness. our monks here orate using thet lae, the unmistakably isan style of sing-sermonizing. after a brief instrumental flourish, they launch forth with the final 3 of the jataka's 13 chapters (chapter 10 "the words of indra", chapter 12 "the six kshatriya" & chapter 13 "the return to the city" [i assume it also features chapter 11 "the great king", but i don't know the text well enough to identify it]). these are old tapes and have a good bit of mechanical noise, but if you can get through it, you'll find a great document of a unique & compelling tradition. it's a 3 hour set, so i've kept with the original tape divisions and put it up in 3 parts.. make sure you get all three, and enjoy! Thank you for these wonderful posts! I was wondering if it is possible to re-up this one, it would be fantastic.